J. C. Leyendecker, Advertisement for Kuppenheimer, 1910/20. Courtesy The Advertising Archives. Firms such as Kuppenheimer, a Chicago-based men's clothing manufacturer, recognized that an artist as gifted as Leyendecker could transform the fortunes of its business, as he had done for the Arrow Company. Pencil and watercolour. Courtesy The Bridgeman Art Library. As well as designing costumes for the Ballets Russes, Bakst illustrated 'fantasies sur le costume moderne', some in collaboration with the house of Paquin. The classically inspired 'Dione' closely resembles Fortuny's 'Delphos' gown, while the cloak may have been a design by Dufy for Poiret. Dufy's woodblock print for Poiret's Persian-style coat, lavishly trimmed with fur. Photograph of 'La Perse' by Paul Poiret, 1911. Courtesy Bibliothèque Nationale de France. 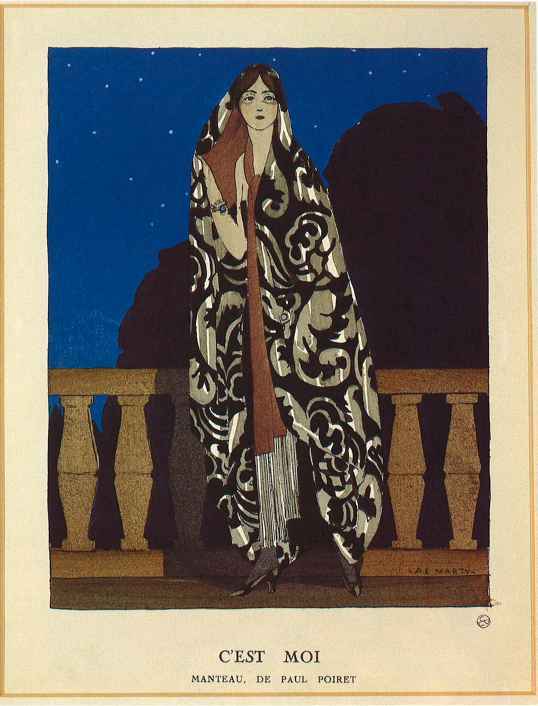 A. E. Marty, 'C'est Moi', cloak by Paul Poiret, Gazette du bon ton, June 1922. Pochoir print. Courtesy The Stapleton Collection. Marty was one of the original group of young artists, or 'Knights of the Bracelet' as they called themselves, employed by Vogel on the Gazette. 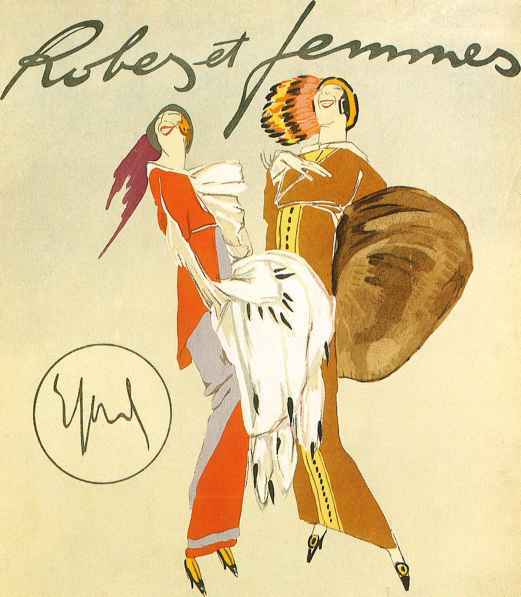 This much later illustration demonstrates Poiret's continuing use of dramatic effect, which was rapidly becoming outmoded. 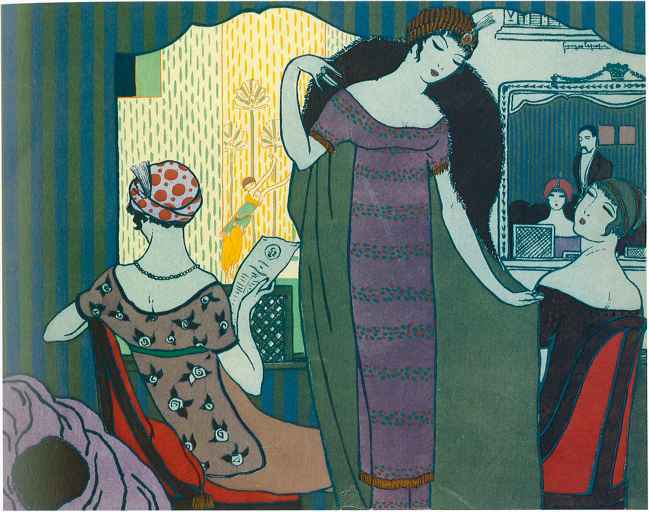 Georges Lepape, Plate from Les Choses de Paul Poiret, 1911. Pochoir print. Courtesy The Stapleton Collection. Lepape's use of a low horizon and flat planes of colour reveal the influence of Japanese woodblocks (his uncle was the main dealer in Paris for such prints). Equally innovative are Poiret's sheath-like gowns. The simplified style usee by Lepape may have influenced fashion. Indeed, he claimed that his wife was responsible for at least four of the designs in I.es Choses, demonstrating the sometimes symbiotic relationship between illustrator and designer. Poiret made the turban his signature headwear, inspired by a visit to the Victoria and Albert Museum, London, where he studied Indian examples. 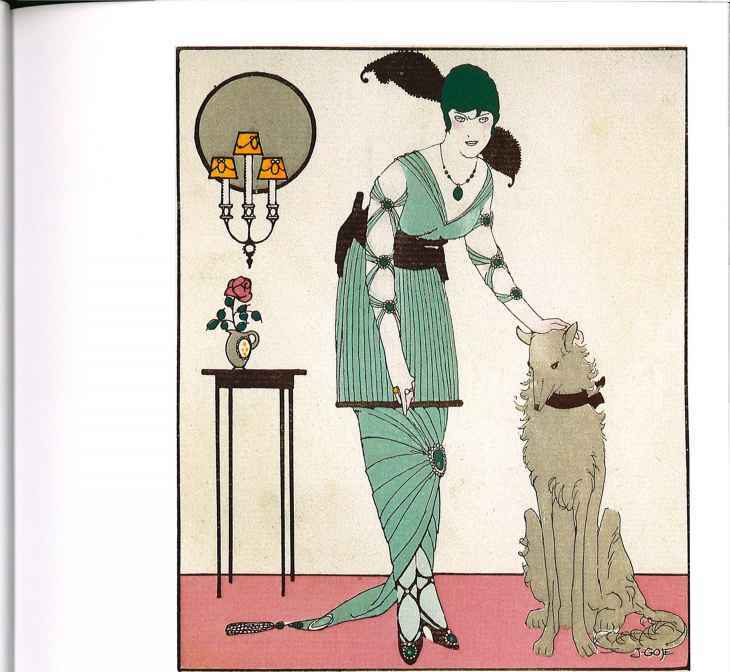 George Barbier, Fan for Madame Paquin, 1911. Pochoir print with painted silk on reverse, painted bone sticks and guards. Courtesy V&A Images/Victoria and Albert Museum. 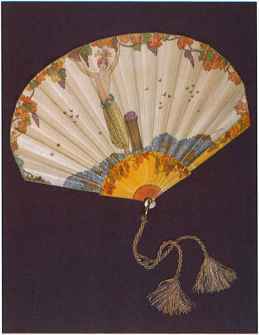 Fans were often used as vehicles for advertising. Madame Paquin, a well-established Paris couturier, commissioned a deluxe album, L'Uventail et lafourrure chez Paquin, from Paul Iribe in collaboration with Lepape and Barbier. Mela Koehler, Postcard no. 523,1911. Courtesy MAK: Austrian Museum of Applied Arts/Contemporary Art, Vienna. 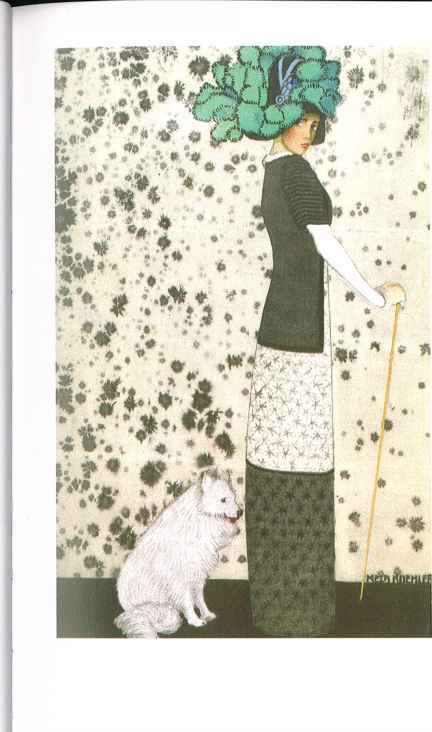 The postcard features 'Bergfalter' fabric by Koloman Moser, one of the Wiener Werkstâtte group closely associated with Viennese Sezession artist Gustav Klimt. A collective of artists, designers and craftsmen, the Wiener Werkstâtte had been founded in 1903 by Moser and the architect Josef Hoffmann. Their philosophy was that 'artistic endeavour should permeate all aspects of everyday life'. Photograph of 'Bergfalter' dress, 1911. Courtesy MAK: Austrian Museum of Applied Arts/Contemporary Art, Vienna. 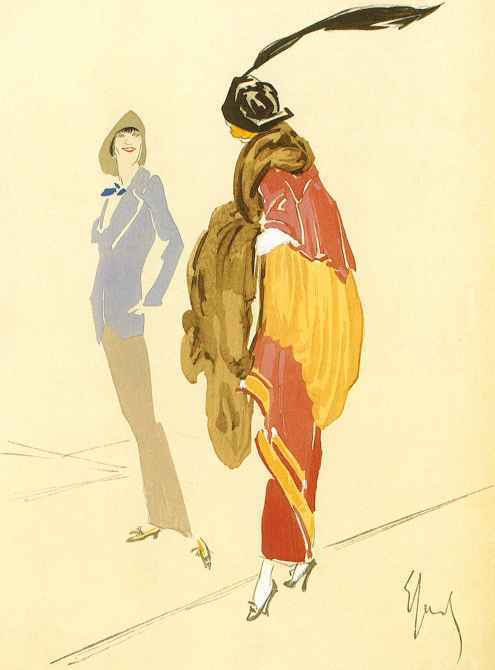 An example highlighting the transformative power of fashion illustration. In Koehler's illustration, both garment and model are imbued with an elegance and style that is entirely missing in this photograph. Eduard Wimmer-Wisgril, Design for a dress, 1912. Courtesy MAK: Austrian Museum of Applied Arts/ Contemporary Art, Vienna. Founder of the Wiener Werkstatte fashion department in 1911, which aimed to combine art and fashion, Wimmer-Wisgril also designed textiles, postcards, metalwork, jewellery and bookbinding. Dagobert Peche, Design for a dress, from portfolio Viennese Fashion 1914-15. Coloured linocut. Courtesy MAK: Austrian Museum of Applied Arts/Contemporary Art, Vienna. 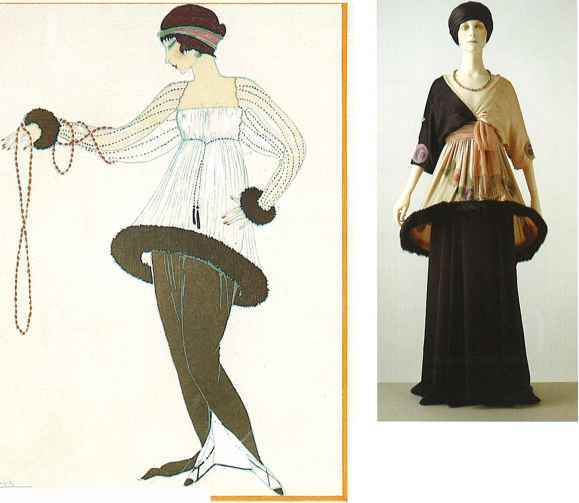 Embodying aspects of dress reform as promoted by the Arts and Crafts Movement, and influenced by Poiret's work (he visited Vienna in 1911 and purchased Werkstatte fabrics), the fashion department of the Werkstatte group produced relatively loose 'artistic' clothes. Peche was one of the leading textile designers of the group. Enrico Sacchetti, Frontispiece of Robes et femmes, 1912. Pochoir print. Courtesy The Stapleton Collection. Sacchetti, who collaborated with Marinetti, the father of Futurism, on his magazine Poesio, worked as a fashion illustrator in Paris immediately before the war. Enrico Sacchetti, Robes etfemmes, 1912. Pochoir print. Courtesy The Stapleton Collection. 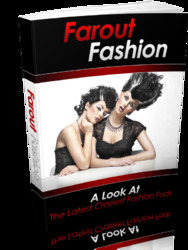 Here Sacchetti satirizes the fashion victims of the day and contrasts their overblown style with the easy elegance introduced by Chanel. 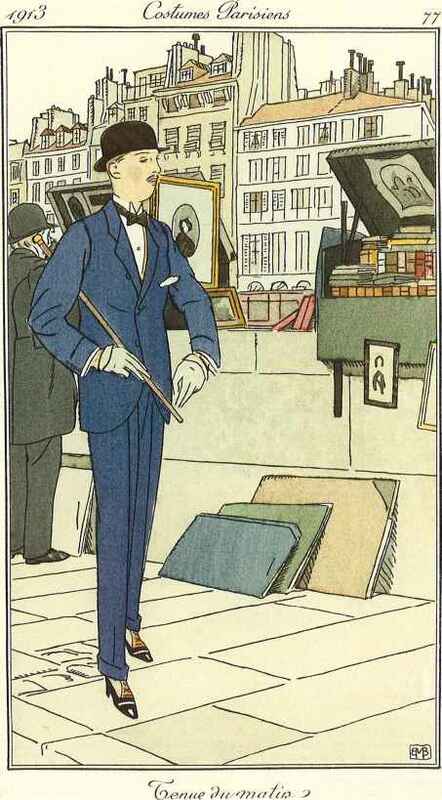 George Barbier (above), The Madness of the Day' Journal des dames et des modes, 1913. Coloured lithograph. Courtesy The Stapleton Collection. New popular music and cance crazes swept Europe and the USA in the first decade of the century. Ragtime, the turkey trot, the bunny hug and the tango made tea dances all the rage. The American couple Irene and Vernon Castle wowed the nightclubs of Paris and London with their performances. Here a stout dowager looks disapprovingly at the lampshade tunic and exotic turbans worn by the young dancers. 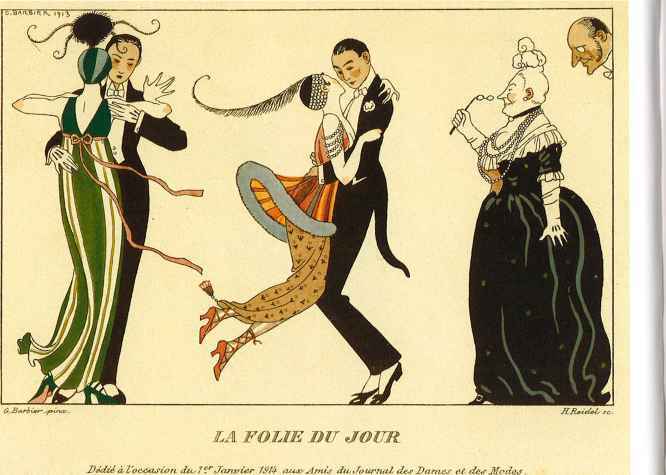 Bernard Boutet de Monvel (right), Plate from Costumes Parisiens, 1913. Courtesy The Stapleton Collection. A three-piece lounge suit with contrasting waistcoat hints at increasing informality. Boutet de Monvel, another member of the artists' group known as the 'Knights of the Bracelet', was himself a renowned dandy. 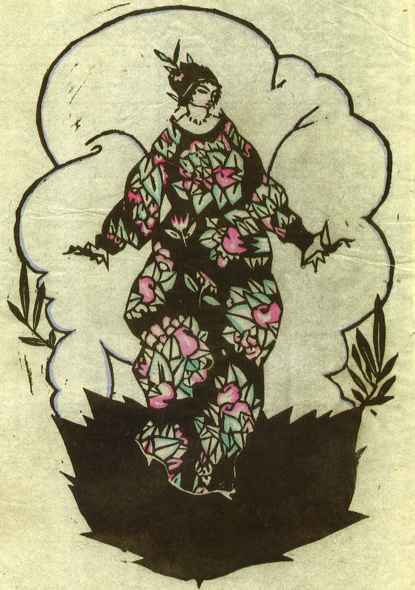 Georges Lepape, 'Le Collier Nouveau', Gazette du bon ton, January 1914. Pochoir print. CSM Archive. Lepape frames Poiret's lampshade tunic and hobble skirt with his signature orange border, painted with a Chinese calligraphy brush. Photograph of 'Sorbet' by Paul Poiret, 1912. Courtesy V&A Images/Victoria and Albert Museum. Poiret's lampshade tunic, made of silk chiffon and satin, and embroidered with glass beads, is trimmed with black fox fur and wired to stand out at the hem. 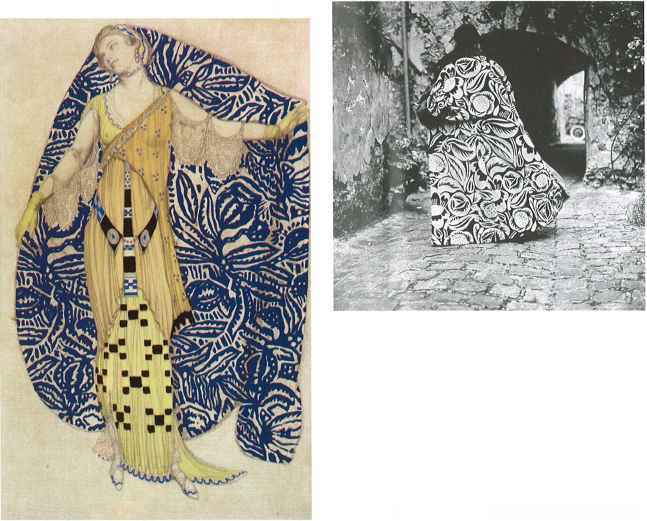 Erte, Two designs for Paul Poiret, 1914. Ink and watercolour. Courtesy Galerie Bartsch & Chariau, Munich. After leaving Russia, Erte began his career as a fashion designer in Paris in 1911. 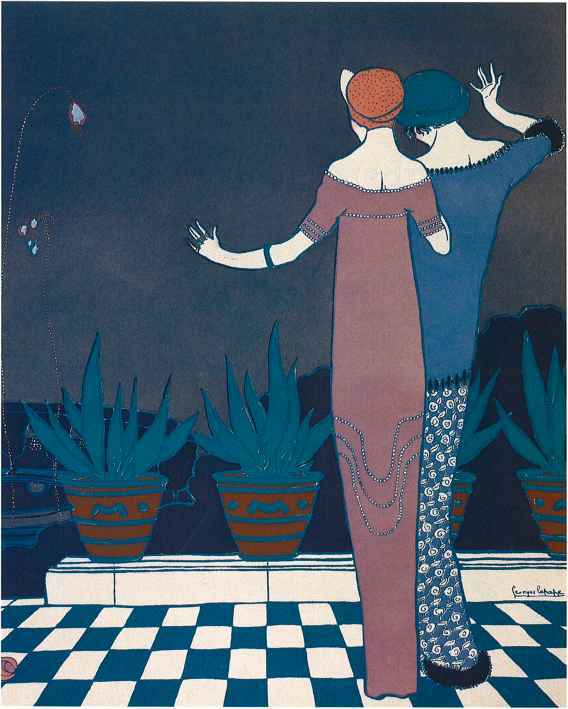 He was soon employed by Poiret, until the outbreak of the First World War, when he started to illustrate for Hearst's Harper's Bazar, a magazine for which he worked for 22 years. After terminating his contract, he went on to design for the theatre and for Metro-Goldwyn-Meyer films. Pierre Brissaud, 'En Tenue de Parade', Gazette du bon ton, February 1914. Pochoir print. CSM Archive. A walking costume that directly refers to military uniform, in particular that of the Hungarian Hussars, elements of which, such as the Brandenbourg froggings and fur trim, had entered the fashionable wardrobe in the 18th century. 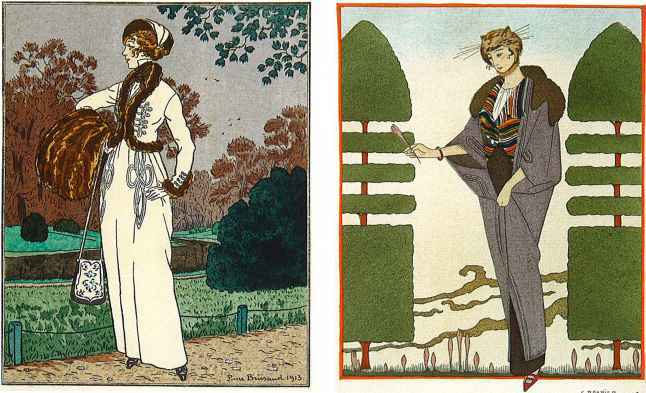 George Barbier, 'Les Colchiques', Gazette du bon ton, January 1914. Pochoir print. CSM Archive. A whimsical travelling ensemble by Paquin with a cat's-mask helmet. 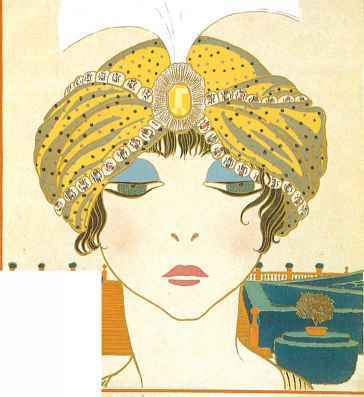 Barbier, another of Vogel's original team at the Gazette, was a prolific illustrator. Never as experimental as some of his colleagues, his flat, decorative style was influenced by Persian art.